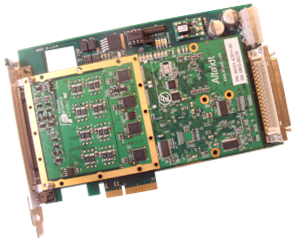 Alta Data Technologies’ PCIEC4L-MA4 interface module is a multi-channel, multi-protocol 1553 and ARINC ½ size PCI Express 4 Lane interface card (PMC on 4 Lane PCI Express Carrier) is supported by the latest software technologies. Alta Data Technologies’ PCIEC4L-MA4 interface module is a multi-channel, multi-protocol 1553 and ARINC ½ size PCI Express 4 Lane interface card (PMC on 4 Lane PCI Express Carrier) is supported by the latest software technologies. The PCIEC4L card is based on the industry’s most advanced 32-bit FPGA protocol engine, AltaCore™, and by a feature-rich application programming interface, AltaAPI™, which is a multi-layer ANSI C and Windows .NET (MSVS 2005/08/10 C++, C#, VB .NET) architecture. This hardware and software package provides increased system performance and reduces integration time. 1-5 Independent, Dual Redundant MIL-STD-1553 Channels, Optional 8 ARINC Channels. PMC on PCIe 4x Lane Carrier. Channels May be Factory Configured to fix ARINC RX/TX or Monitor Only 1553. Here you can find documentation pertaining to the PCIEC4L-MA4. For additional documentation and software, please visit our secure download area. PCIEC4L-MA4-1D8-T PCI Express (PMC on 4 Lane Carrier) with One Channel of Dual Redundant MIL-STD-1553 with Dual Function (BC/Mon or mRT/Mon) Capability and 4 Shared Tx/Rx Channels and 4 Rx Channels of ARINC-429 and 2 Rx/2 Tx ARINC-717 Selectable Channels (Each 717 Rx/Tx Replaces Two 429 Channels). Included: Thumb Screw SCSI I/O Connector (Must Use -T Series Mating Connector) and AltaAPI Software. PCIEC4L-MA4-2D8-T PCI Express (PMC on 4 Lane Carrier) with Two Channels of Dual Redundant MIL-STD-1553 with Dual Function (BC/Mon or mRT/Mon) Capability and 4 Shared Tx/Rx Channels and 4 Rx Channels of ARINC-429 and 2 Rx/2 Tx ARINC-717 Selectable Channels (Each 717 Rx/Tx Replaces Two 429 Channels). Included: Thumb Screw SCSI I/O Connector (Must Use -T Series Mating Connector) and AltaAPI Software. PCIEC4L-MA4-3D8-T PCI Express (PMC on 4 Lane Carrier) with Three Channels of Dual Redundant MIL-STD-1553 with Dual Function (BC/Mon or mRT/Mon) Capability and 4 Shared Tx/Rx Channels and 4 Rx Channels of ARINC-429 and 2 Rx/2 Tx ARINC-717 Selectable Channels (Each 717 Rx/Tx Replaces Two 429 Channels). Included: Thumb Screw SCSI I/O Connector (Must Use -T Series Mating Connector) and AltaAPI Software. 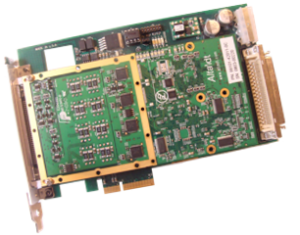 PCIEC4L-MA4-4D8-T PCI Express (PMC on 4 Lane Carrier) with Four Channels of Dual Redundant MIL-STD-1553 with Dual Function (BC/Mon or mRT/Mon) Capability and 4 Shared Tx/Rx Channels and 4 Rx Channels of ARINC-429 and 2 Rx/2 Tx ARINC-717 Selectable Channels (Each 717 Rx/Tx Replaces Two 429 Channels). Included: Thumb Screw SCSI I/O Connector (Must Use -T Series Mating Connector) and AltaAPI Software. PCIEC4L-MA4-5D8-T PCI Express (PMC on 4 Lane Carrier) with Five Channels of Dual Redundant MIL-STD-1553 with Dual Function (BC/Mon or mRT/Mon) Capability and 4 Shared Tx/Rx Channels and 4 Rx Channels of ARINC-429 and 2 Rx/2 Tx ARINC-717 Selectable Channels (Each 717 Rx/Tx Replaces Two 429 Channels). Included: Thumb Screw SCSI I/O Connector (Must Use -T Series Mating Connector) and AltaAPI Software. PCIEC4L-MA4-1F8-T PCI Express (PMC on 4 Lane Carrier) with One Channel of Dual Redundant MIL-STD-1553 with Full Function (BC/mRT and Mon) Capability and 4 Shared Tx/Rx Channels and 4 Rx Channels of ARINC-429 and 2 Rx/2 Tx ARINC-717 Selectable Channels (Each 717 Rx/Tx Replaces Two 429 Channels). Included: Thumb Screw SCSI I/O Connector (Must Use -T Series Mating Connector) and AltaAPI Software. PCIEC4L-MA4-2F8-T PCI Express (PMC on 4 Lane Carrier) with Two Channels of Dual Redundant MIL-STD-1553 with Full Function (BC/mRT and Mon) Capability and 4 Shared Tx/Rx Channels and 4 Rx Channels of ARINC-429 and 2 Rx/2 Tx ARINC-717 Selectable Channels (Each 717 Rx/Tx Replaces Two 429 Channels). Included: Thumb Screw SCSI I/O Connector (Must Use -T Series Mating Connector) and AltaAPI Software. PCIEC4L-MA4-3F8-T PCI Express (PMC on 4 Lane Carrier) with Three Channels of Dual Redundant MIL-STD-1553 with Full Function (BC/mRT and Mon) Capability and 4 Shared Tx/Rx Channels and 4 Rx Channels of ARINC-429 and 2 Rx/2 Tx ARINC-717 Selectable Channels (Each 717 Rx/Tx Replaces Two 429 Channels). Included: Thumb Screw SCSI I/O Connector (Must Use -T Series Mating Connector) and AltaAPI Software. PCIEC4L-MA4-4F8-T PCI Express (PMC on 4 Lane Carrier) with Four Channels of Dual Redundant MIL-STD-1553 with Full Function (BC/mRT and Mon) Capability and 4 Shared Tx/Rx Channels and 4 Rx Channels of ARINC-429 and 2 Rx/2 Tx ARINC-717 Selectable Channels (Each 717 Rx/Tx Replaces Two 429 Channels). Included: Thumb Screw SCSI I/O Connector (Must Use -T Series Mating Connector) and AltaAPI Software. PCIEC4L-MA4-5F8-T PCI Express (PMC on 4 Lane Carrier) with Five Channels of Dual Redundant MIL-STD-1553 with Full Function (BC/mRT and Mon) Capability and 4 Shared Tx/Rx Channels and 4 Rx Channels of ARINC-429 and 2 Rx/2 Tx ARINC-717 Selectable Channels (Each 717 Rx/Tx Replaces Two 429 Channels). Included: Thumb Screw SCSI I/O Connector (Must Use -T Series Mating Connector) and AltaAPI Software.